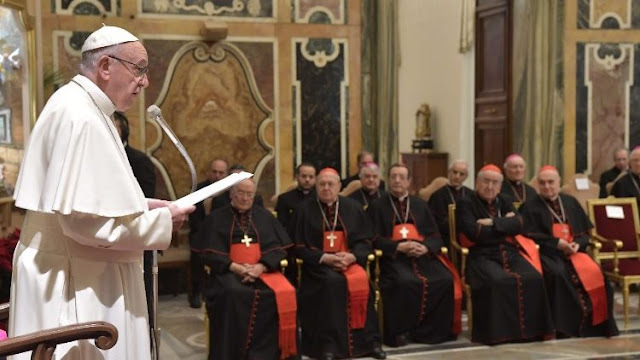 Full text of the English translation of Pope Francis' address to members of the Roman Curia in the Vatican on Thursday morning. Below please find the complete and official translation of the speech. Recently, in greeting the Fathers and Heads of the Oriental Catholic Churches, and reflecting on this ministerial, petrine and curial finality of service, I used the expression “diaconal primacy”, which immediately calls to mind the image of the Servus servorum Dei, so beloved of Saint Gregory the Great. This definition, in its Christological dimension, is above all the expression of a firm desire to imitate Christ, who took on the form of a servant (cf. Phil2:7). Benedict XVI, in this regard, has said that on the lips of Gregory this phrase was “no mere pious formula, but a true manifestation of his way of living and acting. Gregory was deeply moved by the humility of God, who in Christ made himself our servant, who washed and continues to wash our dirty feet”. “As for the Church’s deacons, let them serve as the eyes of the bishop, looking all around and investigating the actions of each in the Church, in case anyone is about to sin. In this way, admonished beforehand by the presider, perhaps that person will not commit [his or her sin]”(Letter of Clement to James, 12: Rehm 14-15, in I Ministeri nella Chiesa Antica. Testi patristici dei primi tre secoli a cura di Enrico Cattaneo, Edizione Paolina, 1997, 696).